Ali Wazeer, a central committee member of The Struggle group, has won a seat in the national parliament with 23,530 votes on July 25. His closest rival for the seat, from a religious alliance, got only 7515. A key leader of the Pashtun Tahafaz Movement (PTM), Wazeer was one the organisers of the mass meetings organised in major cities that demanded fair compensation to the victims of the “war on terror”. This campaign also demanded the release of all “missing” persons, or else that they be tried in court. In his election victory speech on July 26, Imran Khan gave a sober talk that ran contrary to the violent language he used throughout the election campaign, notes Farooq Tariq from Lahore. Khan’s Pakistan Tereek-e-Insaf (PTI) “won” 116 seats in the National Assembly out of the 342 seats, of which 278 seats are contested directly on the First Past the Post (FPTP) system. Large swathes of Pakistan are in the stranglehold of a caricatured feudalism, writes Farooq Tariq. Nepal’s Communists have won a landslide victory in the elections for House of Representatives of Federal Democratic Republic of Nepal held in two phases on November 26 and December 7. In the 275-seat parliament, the elections were held for 165 seats under the first past the post system (FPTP), with the remaining 110 seats determined by a proportional system. The following statement was released on November 11 by Farooq Tariq, spokesperson for the Awami Workers Party in Pakistan. On the night of November 3, the Turkish police detained Selahattin Demirtaş and Figen Yüksekdağ – the co-chairs of the People’s Democratic Party (HDP) – alongside several other Members of Parliament who were democratically voted in with over 5 million votes in the last parliamentary election. In the dead of night on July 17, police vans snaked their way into Chak 4-L village in Okara City in Punjab province. At about 2am, several dozen police officers forced entry into the house of Mehr Abdul Jabbar, younger brother of jailed peasant leader Mehr Abdul Sattar. They broke down the front door and opened fire indiscriminately, shattering cupboards and other household items. They departed 15 minutes later but left behind a cloud of uncertainty and fear that spread among the villagers jolted awake by the gunfire. 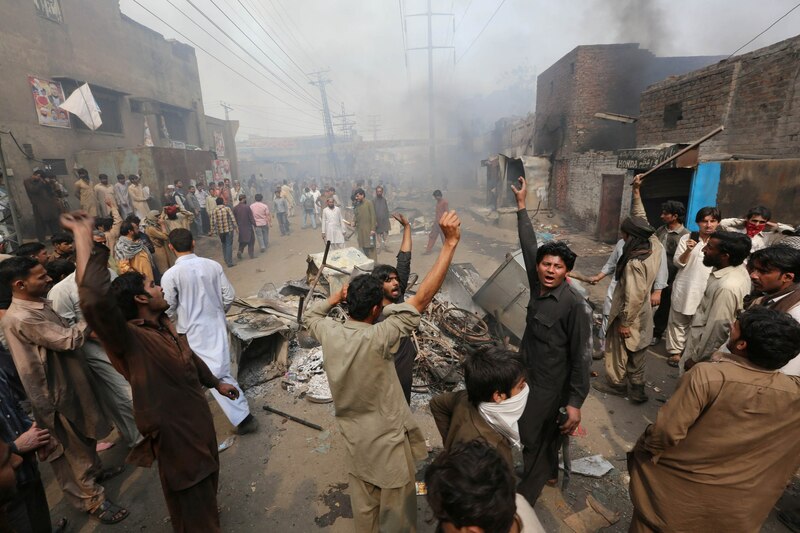 Fundamentalist mob torches Christian neighbourhood in Lahore. March, 2013. Religious terrorism has become one of the major challenges for most Asian countries, particularly in South and West Asia. It has resulted in seemingly non-stop bombings, suicide attacks and other means of terrorism. A massive wave of repression against the militant but peaceful peasant movement — the Anjuman Mozareen Punjab (AMP) — is underway. Most of its leadership have been arrested on false charges under anti-terrorist laws. Dozens are missing while more than 50 remain behind bars. All have been declared “terrorists” by the Okara district police, working hand in hand with the Military Farms administration, which mainly serves military officers. On May 18, Baba Jan was declared the official candidate of the Awami Workers Party (AWP) by the returning officer of Gilgit-Baltistan Legislative Assembly constituency Hunza 6. Baba Jan is in jail serving a life sentence. This is the first time in the history of the Hunza Valley that a political activist will contest general elections from jail. Gilgit-Baltistan is a Himalayan territory administered by Pakistan. The 18th South Asian Associations for Regional Cooperation (SAARC) summit took place at Kathmandu, Nepal on November 25 and 26. The heads of the eight states of South Asia took part in the summit. Kathmandu was a showcase of what has happened repeatedly in the three decades since the birth of the SAARC. Leaders make rhetorical speeches and spend time on expensive retreats and sightseeing — then head home forgetting what was said in the summit hall.